This is my entry in the Johnsonville® Kabob Creations contest. I stuff mini bell peppers with chunks of their chicken sausage to create a simple, quick and light summer dish that is perfect for the grill. I made two batches of these kabobs. For the first I used the Three Cheese Italian Style, and for the other I used their Chipotle Monterey Jack variety. Both were good, but the chipotle version was the clear winner at our house. It just had a bolder flavor, and the added touch of spiciness was welcome. 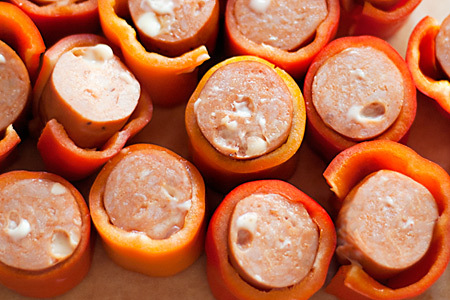 The trick to these is finding mini bell peppers that are large enough to hold the sausage pieces without splitting. I was somewhat successful, but there came a time where I just had to make what I had work. 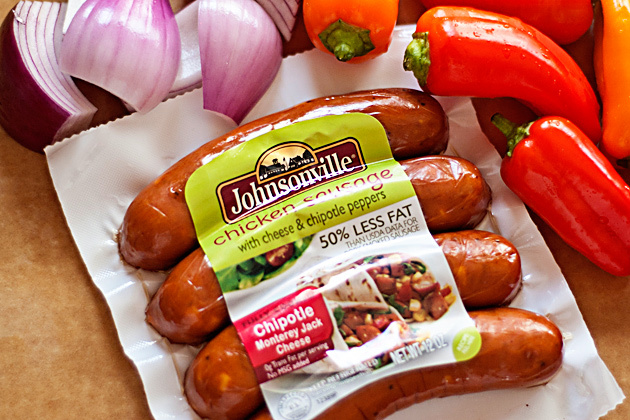 1 package (12 oz) Johnsonville® chicken sausage (any variety), sliced to 1"
8-10 Mini bell peppers, sliced to 1"
Note: If you use wooden skewers be sure to soak them in water for at least an hour before assembling your kabobs. This will help to prevent them from burning. Whisk together the honey, butter and Worcestershire sauce in a small bowl and set aside. Insert each piece of sausage into a ring of pepper as best you can. As the pieces of pepper get smaller you will have to trim the sausage pieces to fit. Some of the rings will split, but that's fine. 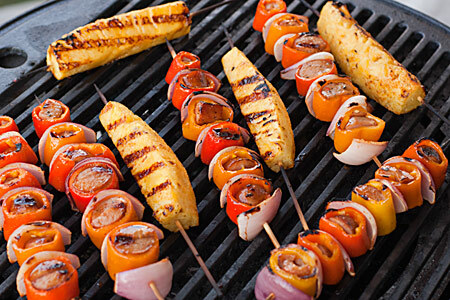 Prepare your grill for direct grilling at medium heat (300-325°). 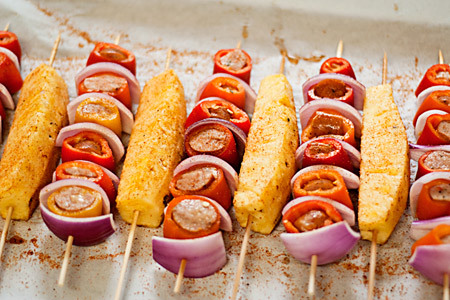 Thread the wrapped sausage onto a skewer with a piece of onion between each. Repeat with the remaining sausage. Spray all sides of each kabob with the cooking spray and grill them direct for about four minutes. Turn them over, brush with the honey mixture, and grill another 4-5 minutes. 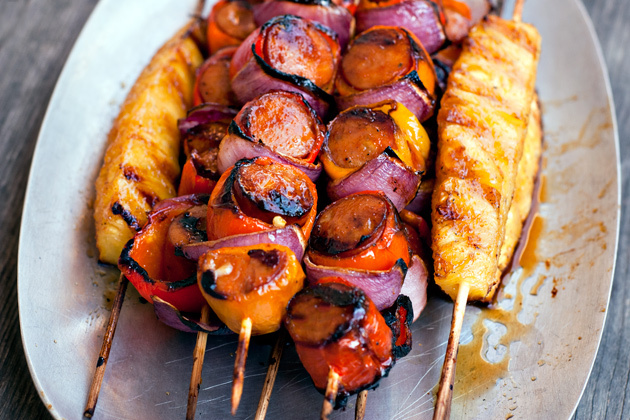 Brush again with the honey mixture, then remove the kabobs from the grill. Serving suggestions: I served mine on saffron rice with some grilled pineapple. They would also be great tossed into some simple butter and garlic pasta. Disclaimer: This post is in partnership with Johnsonville®, but the recipe is completely my own. John, looks great. I am going to give this one a try. I would never have thought to wrap the pepper around the sausage chunk. Good thinking. Those look great! I love the sausage in the pepper, great idea. Makes the kabobs easy to put together and fun to look at. Wow! It looks so delicious. Thanks a lot for the share. Great job! Sausage for the boys, and pretty peppers for the girls. We're all happy!